It will probably be another year or more before there is real action to redevelop the Hyatt hotel and Knight Center property in downtown Miami. Earlier this month, proposed legislation pending before the Miami City Commission was scheduled to be heard but was withdrawn – by Hyatt. Hyatt officials were planning to get the matter to city voters – as required by city charter – for the August or November ballot. The city owns the 4.2-acre riverfront site at 400 SE Second Ave., home to a Hyatt hotel and the James L. Knight Convention Center. Hyatt Equities LLC wants an extended lease in order to build a new Hyatt Regency hotel and two residential towers, a plan that includes demolishing the convention center. Hyatt officials were met with some resistance when they brought the latest deal to city commissioners May 10. After some general discussion and a few concerns voiced by commissioners hoping for a better deal, the matter was deferred to May 24. When that meeting date arrived commissioners deferred the matter to July 12, without discussion. At the July 12 meeting, the agenda included the two resolutions involving Hyatt Equities, however, the administration told commissioners the items had been withdrawn. Miami Today inquired about the status of the Hyatt site with questions to Daniel Rotenberg, director of the city’s Department of Real Estate and Asset Management (DREAM). “The Hyatt Equities Ballot Question is not going on this year’s election,” Mr. Rotenberg wrote in an email response. “The item was pulled by Hyatt so that Hyatt could continue to work on plans, with their architect, and work on the actual lease agreement, and the development process (including their own selection process for a developer, a formal development order, an operating agreement with their future development partner, etc. ),” he said. 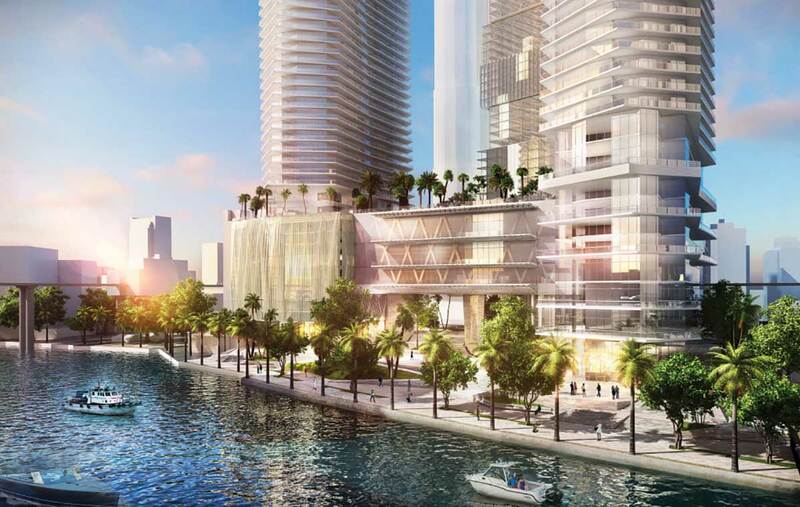 “Once their process moves ahead with more substance, Hyatt will be in a much better position to present a master plan to Commission, and working with the public, with Commission, the Waterfront Advisory Board, and the Miami River Commission, to present a more matured project.,” Mr. Rotenberg wrote. The latest proposal is similar to an idea considered last year, which the commission put off with a directive to staff to negotiate further. The new conceptual plan would clear the site of all buildings, including the convention center, making room for a new 900-room hotel and two mixed-use residential towers with 900 units each, about 50,000 square feet of retail, some office space and parking. The key to opening up the site to many new possibilities would be the demolition of the old convention center, said to be outdated and past its prime. The building open in 1982 and includes an auditorium, a 4,569 seat theater, 22 meeting rooms, and a 28,000 square foot exhibit hall. In comments to city commissioners in May, Mr. Rotenberg explained the city’s giving up the convention center land for the redevelopment. “Let them [Hyatt] use it to go vertical, so the city can increase their revenues at the site and have an iconic hotel and residential complex,” he said then. The deal would mean more revenue to the city, with a minimum guaranteed rent of $2 million a year plus a percentage of gross profits from other uses. In the summer of 2017, Commissioner Ken Russell was pushing for a new master plan for the riverfront and suggesting added open greenspace for the public, and perhaps including the redevelopment and reopening of city-owned Fort Dallas Park just to the west. When the revised Hyatt plan came to commissioners May 10, Mr. Russell stressed how the city’s role in redevelopment of this site is unique. In most cases of a major mixed-use project, a private developer comes to the city with their own land and their own plan, and the city doesn’t have much involvement other than building and zoning matters. “In this case, this is our canvas on which to paint and it can be our best example of our best foot forward, of what the city should be in terms of urbanism, green space, affordability, a place to work and live, transit connected,” Mr. Russell said then. He pushed for affordable housing and mixed income housing as part of the redevelopment. Mr. Russell’s other specific request was designed to gain as much open space as possible. He suggested adding a requirement for a 150-foot setback at the widest, eastern side of the property and a 50-foot setback at the narrower, western side of the property for an unobstructed public riverwalk/greenway at the same elevation as the connected riverwalk. The site is on the north side of the Miami River, abuts Brickell Avenue on the east, and is connected by the riverwalk to Fort Dallas Park. A key feature of the latest plan being touted by Hyatt was to raise the three towers 45 to 50 feet above ground for open vistas and a type of town square green space connected to a landscaped public riverwalk.